By Claudio Iván Remeseira | Posted Saturday, Nov.10, at 11:50 a.m. ET. 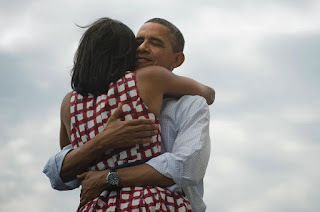 Last Tuesday night, when the election returns confirmed Barack Obama's victory, his team twitted a photograph of the president hugging his wife, along with the phrase "Four more years." The picture, taken by photojournalist Scout Tufankjian, rapidly became the most retweeted in Twitter history and Facebook's most-liked image ever. Tufankjian told Slate the story of the photo and described what it was like to cover the Obamas during the campaign. The photo immediately reminded me of the embracing image of another, quite different presidential couple: Argentina's Eva Perón, "Evita," and Juan Domingo Perón. This image is one of the most iconic—and in this case the adjective is not a cliché—in the history of that South American nation. The picture was taken by presidential photographer Pinélides Aristóbulo Fusco on October 17, 1951, on the most important date in the Peronist calendar. Every year a rally at the Plaza de Mayo, the square in front of the governmental palace in Buenos Aires, commemorated the anniversary of the massive outpouring of workers' support for Perón that took place on that day in 1945 and that signaled the emergence of his populist movement. The 1951 rally marked the birth of television in Argentina: It was broadcast live from Plaza de Mayo by LR3 TV, today's Canal 7, the country's public TV station. In the photo, Juan and Evita are standing on the palace's balcony embracing each other, oblivious to the solicitous officials around them and to the sprawling, adoring crowd gathered below. Evita has just finished one of her most famous speeches, which will also be her last one. A year earlier she had been diagnosed with cervical cancer, and although no efforts were spared to find her a cure, she was dying. She will pass away nine months later, on July 26, 1952, at age 33. That evening on the balcony Evita was so weak that Perón had to hold her from behind while she spoke. After completing the speech, she turned to her husband, broke down in tears, and sunk her face in his chest. 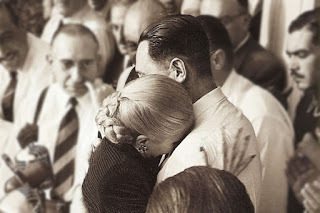 Perón, deeply moved, wrapped his arms around her; they stood like this, a couple lost in each other, their most personal feelings shared unexpectedly with millions in what was probably one the first public-private events of our televised era. Fusco's lens captured the intensity of the moment and produced one of the most memorable images of Argentina's contemporary history. Evita's last speech was also the raw material for the signature songs of two famous musicals. The lesser known of the two, Eva, el gran musical argentino ("Eva, The Great Argentine Musical"), with music by Alberto Favero and lyrics by Pedro Orgambide, premiered in 1986 in Buenos Aires with Argentine actress and singer Nacha Guevara in the title role. The show was intended to be an ideological rebuttal to the supposedly anti-Peronist and far more famous counterpart, Evita, The Musical. But I guess that to Eva Perón, who loved Hollywood stars and movies, that ideological debate would have seemed irrelevant. Instead, she probably would have basked in the glory of her ultimate, worldwide triumph. 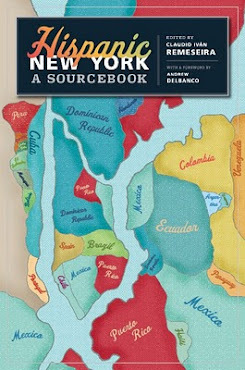 This guy knows how to write --and he knows history too. Cool! I'm a little late in reading this entry due to overwork (and my own recent return to blogging), but just wanted to thank you for this touching photographic diptych, the two images of which surpass all political contentions and remind readers that enormously famous celebrities are, at heart, mere human beings.